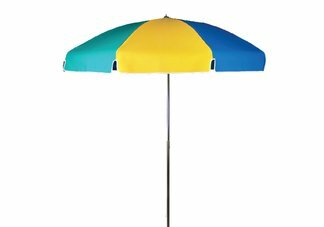 Our 7 1/2' diameter x 8 panel Commercial Grade Steel Patio Umbrella is an excellent umbrella for any outdoor setting. The center pole is heavy gauge aluminum, with an extremely strong tilt mechanism. The steel ribs carry a 1 year limited warranty. The umbrella is held open by the EZup mechanism. Our canopies are made with 9 ounce Marine Grade Solution Dyed Acrylic fabric with a 5 year guarantee against fading.